This will be a summer-short and summer-sweet review of L’Occitane Verbena Summer Secret. I was wondering if spring would ever arrive in Seattle this year, let alone summer, but the weather went from cool and rainy (the heat came on in my house on the Fourth of July) to 92 degrees…in just a few days. During the hot spell, I didn’t feel up to trying out any abstract, complex, or heavy fragrances (I barely felt like writing) so Verbena Summer Secret’s blend of verbena, basil, mint, green apple, “green” anise, cedar and musk sounded like a perfect scent to review. Verbena Summer Secret begins with citrus and hints of basil, anise, and a great, fuzzy mint note (no, I didn’t mean “fizzy”— this mint is dry and “rough”). Verbena Summer Secret’s opening notes are refreshing but fleeting (you’ll be running after them and begging them to return, especially the mint). Verbena is center-stage but not the “star”; it’s well blended with both the top and base notes. The crisp, fresh green apple note is rather elusive: sometimes noticeable (and strong) right out of the bottle, sometimes popping up in mid-development. The base of cedar and super-light, fruity musk provides the longest-lasting component of this fragrance. Verbena Summer Secret didn’t make me moan with pleasure, it didn’t make me fall to the ground in a boredom-induced stupor, and it didn't impel me to throw the bottle across the room in disgust (at my house, things turn dramatic in hot weather); it’s a pleasant, breezy (it lasts about two hours on skin) summer fragrance…a bit stronger than most Eaux de Cologne. Verbena Summer Secret would make an excellent “sport” fragrance for men or women. L’Occitane Verbena Summer Secret (limited edition) Eau de Toilette is available in 100 ml for $46, which qualifies it as a “cheap thrill” in my opinion; other Verbena Summer Secret scented products include a candle, shower jelly, and moisturizing body gel. Note: top left image of The North Wind and the Sun by Milo Winter via Wikimedia Commons. Lol – I wish I could blame my melodrama on the weather! I’m like that all year – with fragrances, books, music, movies. I think it’s because I always have some sort of expectations of transcendence from every day life with all of these things and if it doesn’t blow my mind or change my life, I get very pissy. LaMaroc: well, if there’s MONEY involved that doesn’t help keep me calm either. So how does it rank against the other L’Occitane Verbenas? I live in Snohomish! What a beautiful, perfect day today huh? 80 degrees is just right Enjoy the rest of your week. Oh- great review like always! Tamara: today is PERFECT summer weather! The green apple in this sounds alright… I’d be more afraid of pairing green apple with mint, but I trust the other notes in this one would keep it from smelling like fruity gum. Green apple is also nice in the heat… It’s been real humid here lately, and I’ve been going through a sample of DKNY’s Be Delicious that really hits the spot on the days I don’t feel like sampling and concentrating on a scent. I haven’t fallen in love with it, but it’s really pleasant and has a cooling effect. Dominika: I’ve always liked “apple-mint” jelly, etc…together they work better than separately for me. Please tell me where is the Best Verbena. I have tried so many, and I was always disappointed. One that is most natural with no chemicals in it. Heeley Verveine is very nice, Phemia. It’s not a cheap thrill like the L’Occitaine, but you could get a sample from Luckyscent and see if you like it. Phemia: don’t know about the “best”…but apart from the Heeley, you may want to try the verbenas in the Fragonard and Molinard line-up…they used to be straightforward, not complex renditions. This sounds really lovely. When I read the notes, it sounded like the perfect little cool drink in a bottle for sweltering afternoons (there are plenty of those here in western MI) and would be ideal to pop in the fridge. It’s scary just how much of an L’Occitane whore I’ve become over the last year. I love their Neroli EdP (as more of a vanillic neroli gourmand) and their honey/honey and lemon products. I really want to try this, particularly in the shower gel. Great review, Kevin. Hot weather, according to those around me, makes me pretty dramatic as well. AbScent: I like the lemon-honey offerings from L’Occitane too…and their bath gel/jelly formulations are usually great. Damn you l’Occitane. You’re gonna get my hopes up again aren’t you? Many moons ago, I spent a year abroad in Paris for school. It was a year, but I remember it as one long rainy winter (during which I wore the original Moschino scent which I can never find anymore). When May came and the weather finally turned warm, I popped into one of the many l’Occitane shops in Paris and spritzed the original verbena scent on my arm. For a few moments, I was in heaven. Then it changed, soured a bit, and turned to lemon pledge. I kept dropping in the store (and others of the chain lest the sales people start looking at me funny) to reexperience that first few moments of crisp joy. p.s. My mother can wear the original perfectly… buttery, warm under the sharp crisp top notes. Goodness! I never thought that L’Occitane could cause such drama in a person’s life. I always found the original verbena a disappointment, (tho’ I love the bath stuff). L’O fragrances always seem to fall apart for me after about 10 minutes. I tend to sniff them in airports, bored, waiting for a flight.This is a vulnerable state to be in, but fortunately I’ve never fallen. I hope this new fragrance works for you! Have any other citruses come close to your dream? I wouldn’t say drama, just the realization that there was something out there that I wanted, but that this wasn’t quite it. Like a first boyfriend. I’ve gone through all the traditional citruses, L’eau d’hadrien, Bond No 9’s Little Italy (more lemon pledge), Fresh Hesperides, etc and then there’s the category of what everyone else thinks is citrus, but isn’t pure enough for me: Hermes Eau de Merveilles, various Jo Malones, etc. The closest i’ve come is Guerlain’s Eau de Fleurs de Cedrat. It’s perfect, pure, doesn’t change on me. But is gone in 5 minutes. Can’t find a trace on me. Never seems worth buying a bottle because I KNOW I’d go through one full bottle a week. A Guerlain habit that big is beyond my budget. So I know, I just know the perfect one is out there somewhere… my holy citrus grail, so I will keep searching like the valiant knight of perfume that I am. 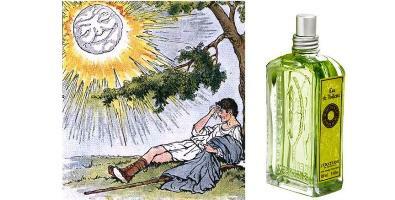 You might try the Diptyque’s Hesperides…not cheap but less than the Guerlain and it comes in a great big bottle. Also, for BIG LEMON look for a bottle of Monsieur Balmain. The older the better, but even the new one has a nice sandalwood dry down. Eau Sauvage? Guess you’ve tried that. Will check out Diptyque and Monsieur Balmain–though I’m sure I’ll only ever get my hands on the new splashy one. Have tried Eau Sauvage, and for some reason, I bring out the woodiness in it more than the citrus. But thanks guys for adding more to the swap list! I wonder what it is that makes perfume designers think that only men want to smell like citrus? Yes, traditional Eau de Colognes have lemony notes to them, but why are the best options out there technically for men?? The Saks counter guy frowns at me everytime I pick up Eau de Fleurs de Cedrat, and tells me, like I’m trespassing that it’s a men’s scent. (They do that to me at the L’Artisan counter too when i’m sniffing for Orientals, but that’s for another post). RLIKESTOSMELL: wonder what’s in that “recipe” that turns so bad (and itches) on so many skins?! If I knew, I’d be making my own private label of the magic, non-turning, non-itching stuff. For some types of fragrances, finding the right one is a joy–such a wealth of great woody scents, incense scents, floral scents (though I don’t do floral easily), that the finding of the right one is like trying on one jeweled creation after another until your heart is sold. I find the search for citrus like shopping at the dollar store–too many poorly made products that will break down on you before you get to the car. Have you tried Hermes Orange Verte? I’ve found the original Eau d’Hadrien in the EdP concentration has *amazing* lasting power for a citrus. Not the EdT, which seems to be gone after an hour or two, but the EdP stays on and I can detect it quite easily several hours later. Granted it isn’t a straight up citrus (there’s a bit of green in it from the cyprus or something along those lines), but it is really lovely and amazing for staying power as far as an Annick Goutal perfume goes. And on my skin, at least, it is a pretty linear fragrance experience. So if you haven’t had any luck since Paris trying to find a citrus that actually lingers, the AG is definitely worth checking out. I was pleasantly surprised. Good luck! So can you tell us what’s the ‘Secret’? Sounds like this will sell well, and fulfill many people’s expectations of a fragrance (that it smells nice, is not ‘too strong’, and is good value for money). In saying this I’m recalling a conversation I had recently with a colleague, in which I admired her fragrance. She had to sniff her wrist to remember what it was – something by Miyake she said eventually. Oh, which one? I ask, genuinely intrigued. She couldn’t remember. So perhaps this latest L’O will be one of those fragrances that people wear casually but mostly forget about once spritzed. I’ll give it a try if it comes my way eventually (it’s winter here). I’d be glad to purchase something where I can at least forget about the cost (more or less)! AnneMarie: I have not idea what the secret is! HA! I get crabby in hot weather too. One summer, when I still lived in Seattle, it was about a million degrees and it felt hotter than the summers here in California (perhaps a combo of no air conditioning and high humidity). Lime popsicles from Trader Joes used to help. Thanks for the review, this fragrance sounds pleasant enough. I’ll have to try it next time I’m near the L’Occitane store. Hee, hee! You made me giggle several times with this one, Kevin. Thanks! Heat and humidity also make me crabby. We’ve had day after day it in Boston, and Marcus Didius Falco Fatcat and Count Maximilian Von Pyrenees (Great Pyrenees entering his senior years) are white furry puddles of misery. At least I have my Green Water and Guerlain Eau L’Imperial to spray on myself … and lo! they were both recommended by Kevin! Dzingnut: oh, good! Ah, the poor dogs…wet ’em, and aim a fan their way! 93 degrees here in the humid south today. My 13 year old daughter came in the house an hour or so ago (had been hanging outside in the sweltering heat with her friends) and began rummaging through my bottles declaring “I must have something scenty to cool me off! !”… exclaims “This will do just fine”…as she grabs a bottle of Miss Marisa by Ebba and stomps from the room. She had been with her father for the last few weeks for the summer and came home yesterday. The minute she walks into my room she grabs for my bottle of Mitsouko and spritzes herself all over as she tells me, “Man…I sure have missed smelling this one”. yes… 13 years old. I am afraid I have created a monster. The outdoor cats certainly don’t appreciate the heat. We caught one all stretched out with his paw over his face in the absolutely perfect portrait of exasperation with the weather. I couldn’t have said it better myself. I had a cat who loved the heat. In 90-degree weather she would climb out the window and stretch out on an asphalt roof. I kept looking for the kitty-size bottle of Bain de Soleil Tropique and the transistor radio. This sounds nice and just along the lines of what I can tolerate now. It’s so hot and humid here I have actually lost energy for asking myself what I’m in the mood for perfume-wise and have been relying on Jo Malone White Jasmine & Mint for the past few days. I’m longing for fall … Thanks for the review, Kevin! Jill: one thing good about Seattle…no humidity (a blessing). Hope a cool breeze blows your way soon! NLB: I never get to try any YR scents…hard to come by in my neck of the woods. …I think the dry “fuzziness” that’s been included in many new releases, follows the popularity of “Light Blue”, which included notes of apple and a dry, cedar base. I tested this scent while shopping this past weekend and found it to be quite pleasant! As I was trying on clothes I kept thinking what’s that lovely smell and it was the new L’Occitane. The other arm was Kiehls Musk oil (very different). Oh, isn’t the Kiehls Musk lovely? I’m a total musk fiend and recently got a sample of it in a swap. It’s *gorgeous* and I love how it’s a musk with a bit of a punch to it. The only reason I haven’t spritzed on more than a couple drops is the heat. We’re supposed to be hitting the high eighties/low nineties in the next couple days and I have the feeling the Kiehls might be a bit too much for the heat. I must try a spritz of this, the original Verbena is one of my favorites. I’ve worn Pre de Provence’s verbena for years, and love it, the huge green soap is another fave. There is just something so refreshing and green about the scent. It’s a must have to cheer me up on a gloomy SF day! I wish L’O would bring back their perfume oils, they were long lasting and very nice too! ST: Do you know Pre de Provence makes massage oil in Verbena and a few other scents? I use the Verbena as a bath oil once in awhile, though I prefer the Green Tea. Might be a good sub for the d/c L’O bath oils that you miss. Pre is so inexpensive too. Thanks for the tip, I didn’t know about the massage oils! I’ll have to check out their online store, I love the Tilleul fragrance too. SmokeyToes: forgot all about the P de Provence line…good stuff. Kevin, on a recent whim I bought the original Verbena in the room spray and candle for our bathroom. It’s very nice, and based on your review I don’t think I’d like the flanker better. Good luck with that heat. Gonna be a scorcher here today, too! Haunani: we’re in temp territory I can deal with now: 78ish. Spring has finally arrived in Buenos Aires, and therefore the 6 month old “Spring” fragrances from the northern hemisphere’s last spring have arrived. This time I must say I agree 100% with Kevin’s review. Spot on. The mint here has better effect and is less overwhelming than on lóccitane verdon.